“And this is my prayer: that your love may abound more and more in knowledge and depth of insight, so that you may be able to discern what is best and may be pure and blameless for the day of Christ, filled with the fruit of righteousness that comes through Jesus Christ — to the glory and praise of God” (Philippians 1:9-11 NIV). I want you to think of somebody who irritates you — maybe somebody you’ve got a strained relationship with or someone who just rubs you the wrong way. I have two questions for you: Do you pray for that person? Or do you just complain and grumble and nag and nitpick? If you prayed more, you’d have a lot less to grumble, complain, nag, and nitpick about. It’s your decision. Does nagging work? No. Does prayer work? Yes. So why do you do more of the thing that doesn’t work than the one that does? Paul says in Philippians 1:4, “Whenever I pray, I make my requests for all of you with joy” (NLT, second edition). Positive praying is more effective than positive thinking. All the positive thinking in the world isn’t going to change your husband or your wife or your child or your friend or your situation. Positive thinking can change you, but it won’t change somebody else. But positive prayer can make a difference in someone else. Do you want to know the quickest way to change a bad relationship to a good one? Start praying for the other person! It will change you, and it can change the other person. Paul even told us how to pray for others: “And this is my prayer: that your love may abound more and more in knowledge and depth of insight, so that you may be able to discern what is best and may be pure and blameless for the day of Christ, filled with the fruit of righteousness that comes through Jesus Christ — to the glory and praise of God” (Philippians 1:9-11 NIV). Pray these for yourself and anyone in your life, and watch how God turns around the relationship you thought was hopeless. Nothing is impossible with God! Who are the people in your life with whom you have a strained relationship and for whom you need to pray these four things? How does positive prayer change you and not just the person for whom you are praying? What is the “fruit of righteousness” that comes through Jesus Christ (see Galatians 5:22-23)? Would you like to experience a deep and meaningful Christmas? In his book called, The Purpose Of Christmas Pastor Rick Warren shows you how Christmas is designed to meet your three deepest needs and how receiving God’s three Christmas gifts to you this year will transform your life forever. This book is one to be read every Christmas and to be shared with your friends who may not know the true meaning of Christmas. 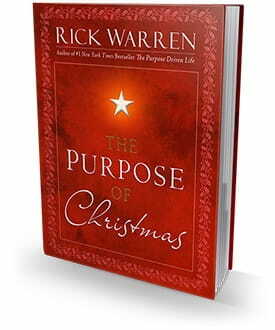 We’ll send you a hardcover copy of the inspiring and beautifully illustrated book The Purpose Of Christmas By Rick Warren, as our way of saying thanks for your financial support of Daily Hope. We’re sure that God will use it to stir up hope, peace and gratitude in your heart this Christmas season.